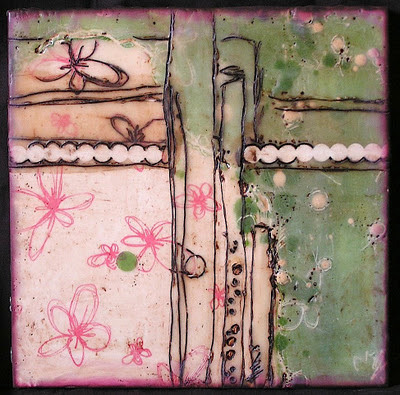 this artist trading card was inspired by this art deco door i found online. the background is acrylic paint on textured watercolor paper...with scratch lines, heat-embossed spiral stamps, and metallic embellies. i made a ton of this really yummy cranberry jelly from scratch for our holiday dinner, and i've been enjoying it every day since. on toast with breakfast, on sandwiches, or just by the spoonful like a jello fruit salad - very versatile. so i thought i'd share my recipe, i was pretty much winging it, but there are other similar recipes out there too. it's really fast and easy to make, and i like the firm texture and golden colors that the mandarin oranges and pineapple add to the mix (don't use fresh or frozen pineapple in gelatin, it won't set). i also love the purplish shade of the blueberries and cranberries combined. i prefer to use canned fruit that's packed in natural juices, and 7-up is all natural flavors now too. using these liquids instead of just more water adds better flavor to the jelly, i think. this recipe makes a pretty large bowl, so you can halve it. soften the gelatin first by mixing it with 1-2 tablespoons of the orange liquid in a small coffee cup. bring sugar and water to a boil in a medium pot. transfer 1/4 cup of the boiling sugar water to the coffee cup to stir and dissolve the gelatin, set aside. add cranberries to the remaining sugar water in the pot and return to boil; simmer a few minutes until the skins pop. stir the gelatin water into the simmering cranberries, then remove from heat. stir in remaining orange/pineapple liquids and 7-up, then mix in all the other fruits. transfer to a decorative bowl or dish, cover with plastic wrap (vent it on one side), and refrigerate overnight to set the gelatin. serve solid by the scoop, or stir it up to serve chunky as shown. enjoy! one of the christmas gifts i received from my mother was this umbrella featuring a really cool painting (1917-18) from an american artist named h. lyman sayen. his work was a mix of fauvism and futurism; he was also an inventor and and electrical engineer. the pulse of modern life animates sayen's dancers in “the thundershower,” which foreshadows the decorative patterns of art deco style. sayen studied with matisse in paris and was among the first to introduce avant-garde styles to america. modern art… is all spontaneity and requires an equally spontaneous apprehension. to feel it requires a quickening of the spirit. it has revealed to us men of great power. picasso and matisse will, I believe, exert a powerful influence for a long time on painting and sculpture. i've seen so many cute handmade needle cases out there lately, so i decided to make one for myself tonight. it's nice to get them out of my pincushions and into a safe spot where i can see the sizes better and it's easy to pull them in and out. this was super quick to make with some felt squares, embroidery floss, and a cute little dragonfly appliqué. i fused some fabric to the inside cover to hide the stitches from the embellishments. i sewed the edges of the inside pages together first, then sandwiched them between the covers with a few french knots and straight stitches. felt is fun and so easy to work with...i made this 6" poinsettia in about 20 minutes by cutting random leaf shapes from a few different shades of green felt, and some small red circles from red. then i layered the leaves on a 5" circle of green felt with aleene's tacky glue, adhered the red berries in the center, and accented with a golden green color of stickles glitter glue. this will be a sweet alternative to a bow on one of my gifts! a few years ago at my favorite annual quilt show (piqf), i bought these cool beads made in africa from recycled glass. i forgot about them until last week when i was digging into my supply to make earrings. then today i was cruising around online and i saw a picture of a cute button ornament in the shape of a wreath. such a perfect idea for using these beads...so out came a little wire, a little ribbon...and a couple minutes later, cuteness for the top of a gift! here's the finished snowman that i started during my recent demo on the cynchronicity live webcast. visit my my youtube channel to see my demo clip. This soft vinyl is often sold in bolts...ask for it at your local craft store or quilt shop to buy by the yard. just made another batch of earrings tonight - sold quite a few pair to my very kind co-workers, some were designs that i forgot to shoot...shoot! anyway, thanks to everyone who supports handmade this holiday season! there was definitely more dunking than there was swapping at our local atc group get-together this past week. with willy wonka as our theme, we thought it was appropriate to enjoy some chocolate fondue. here are the fun artist trading cards that i received from my group. despite an interesting discovery that the non-dairy version of chocolate chips burn in the microwave, which allowed our host the opportunity to confirm that the smoke alarm works in her new home, we had a terrific time dipping loads of different fruits and snacks into the regular chocolate, as we shared which parts of the "charlie and the chocolate factory" story inspired us to make our cards. it's secret santa time at my office...our holiday luncheon and gift exchange is tomorrow, always a great day! we each fill out little slips of paper with our names and lots of favorite things. the coworker whose name i drew enjoys scrapbooking, the color teal, and coffee. so i made her this little 5x7 blank board book, with a variety of distressed teal-ish patterned papers inside, that she can put her own pictures in. i placed a starbucks gift card inside. i hope she likes it...and i hope i'm right in assuming she won't read my blog until after the luncheon! 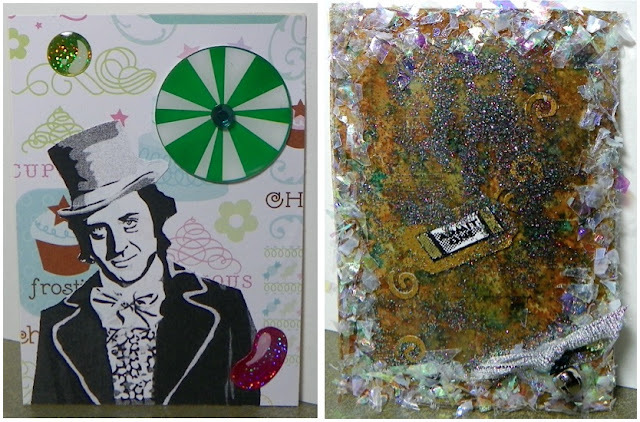 here's a slideshow of the artist trading cards from last month's swap. there's still time to join us for the november/december swap - the last one for this year! click here for details. i'm looking forward to demo-ing how to make this little christmas cutie...it can be used as a tree ornament or a gift tag. 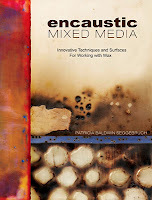 i will be a guest on my friend cynthia's creative edventures webcast next wednesday, 12/14 at 6pm pacific (9pm eastern). i'll show y'all how quick and easy my little snowman is to make with whatever fibers and glitter you have on hand. click here at showtime next week to join us online for some crafty fun! my atc group is having a chocolate fondue potluck this week, to go along with our willy wonka theme. i prefer the gene wilder version of the film, so i found this posterized pic of him and printed it on inkjet film. 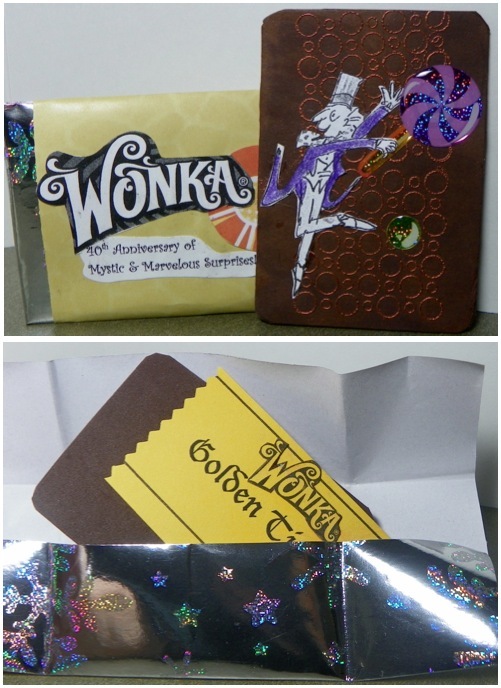 then i layered it the film on top of some backgrounds that I painted/stamped, and secured it with candyish mini-brads. i accented his hatband and bow tie with some glitter and gloss. i really love the expression on his face...a little exasperated, somewhat dazed...i can so relate, lol! come to our encaustic workshop! i am over the moon about this news...i am hosting an all-day encaustic workshop, taught by artist and author patricia baldwin seggebruch (aka trish baldwin). her new book (pictured below) is a must-have, btw! 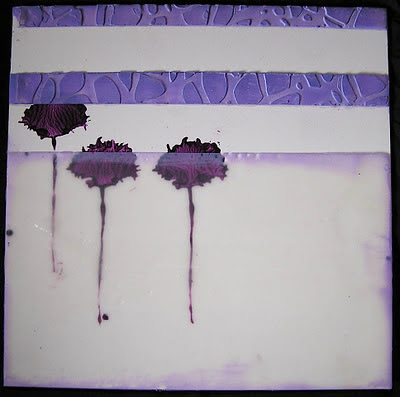 if you aren't familiar with encaustic, it's a form of mixed media art that involves melted beeswax...tint it, paint with it, trap stuff inside it, transfer images on to it, swirl it wet, carve it dry...sooo much fun! how to register: email me at lisa@lisalizalou.com with your full name, address and phone. you can pay via paypal or mail a check...we will work out payment privately over email. maximum class size is 12 people - so take the day off work and register soon...all skill levels welcome, and newbies too! don't miss this incredible workshop with a wonderful teacher...can't wait to see you! just a little fun with a 7 gypsies victoria paper stack - i haven't made any greeting cards in a while, but i'm feeling the tickle to make some again. i do love themes around flying, journeys, being free. i also am diggin' the longer narrower format for a #10 envelope. 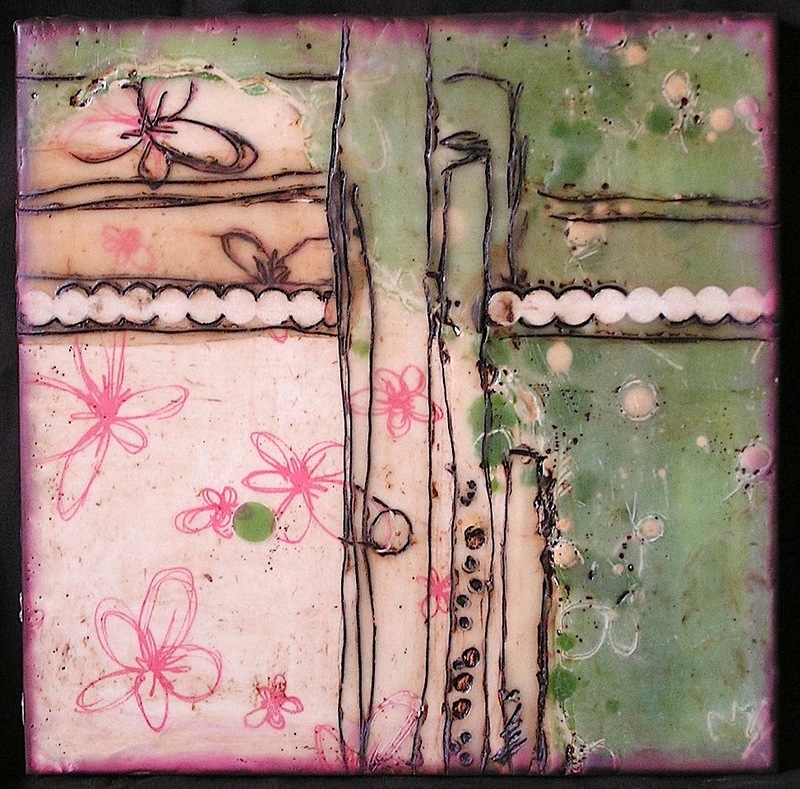 i offset the score and placed a border paper on the inside to peek out to the front. click the pic to enlarge. these are the atc's i made for this month's theme with my local swap group...lucy in the sky with diamonds. of course i interpreted this theme quite loosely, using just the fact that this beatle's song lyrics are about dream imagery. the backgrounds are from under water pictures i took from a snorkeling trip in the caribbean several years ago. being under water feels like dreams feel, kinda sorta. then i added some rainbow swirl film and some sky colored embellies, including one tiny "diamond." i took a couple months off from hosting my online atc swap, and i'm ready to get back to it! the theme is autumn leaves - all the details are on the atc swap tab at the top of the blog. i included several leafy links for inspiration, too. all are welcome to get creative and join in the fun! 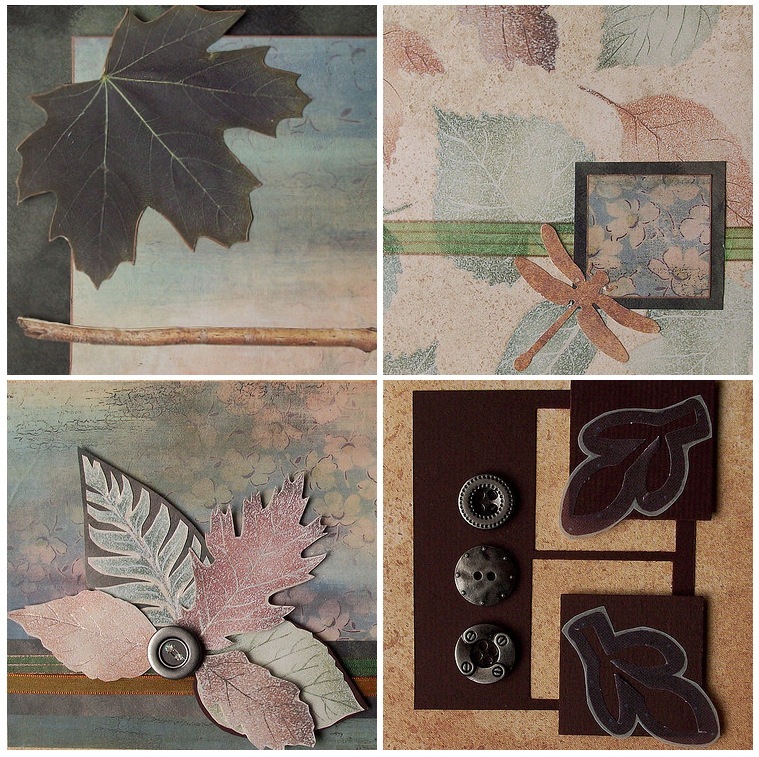 btw, this little image grid shows off snippets of four different autumn greeting cards i made years ago. we tested our paper folding skills the other night, i haven't done origami in years. 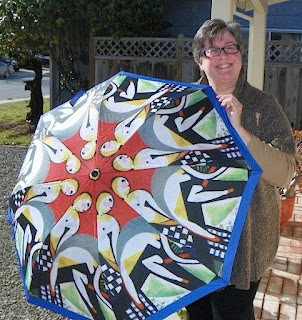 a tulip, a pinwheel, a seagull, and a party hat. it was fun - for the party hat i crinkled the paper first, i like the texture a lot. click the pic to zoom in. august 5 is the deadline if you want to participate in my july atc swap - all the details are on the atc swap link at the top of the blog here. the theme is spark! 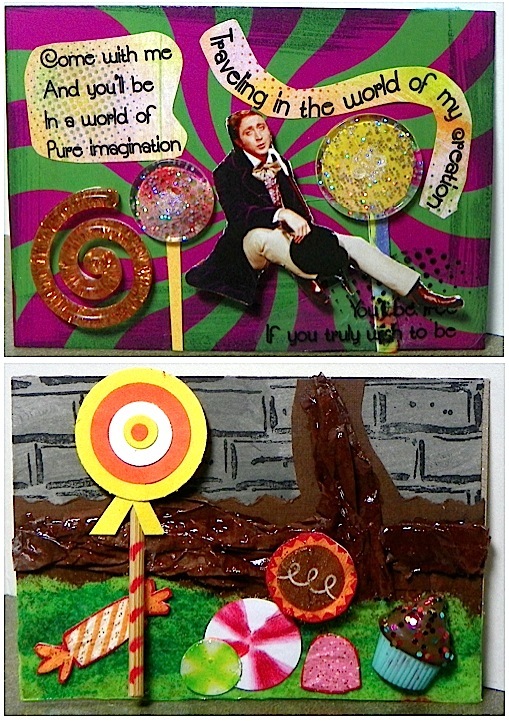 check out the fun we had with the june swap...all are welcome to join in the fun each month. here are the wonderful bird-themed atcs i received in my swap last night - click the pic to zoom in. the most fun part of our monthly swaps for me (besides all the eating and chatting) is telling each other exactly how we made our cards. 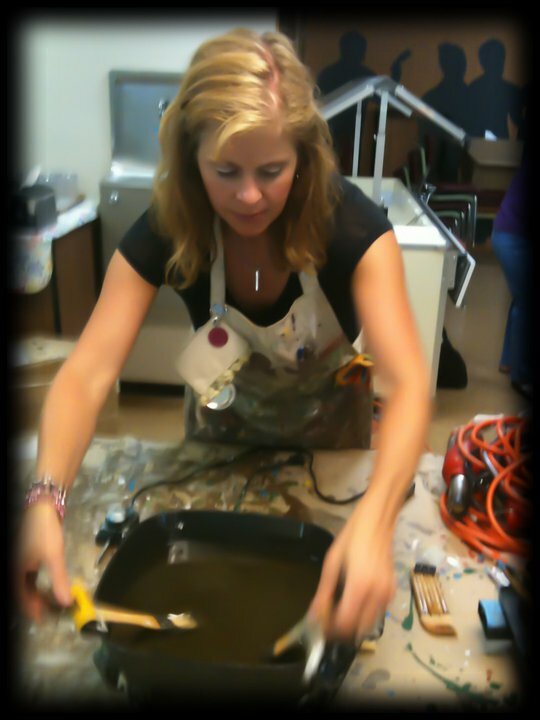 i always come away with a greater appreciation for everyone's creative efforts, as well as ideas for new techniques or materials after hearing their experiences. my poor neglected bloggy, it has been weeks! anyway, tonight was my monthly local atc group get together. mmm, we ate sushi, and mozzarella sticks, and fruit salad, and chips, and chocolate, and cookies...oh, um and yes, right, we swapped atcs too! our july theme was birds. i used these gorgeous handpainted papers that my friend lisa gave me because her wonderful brush strokes felt feathery to me. I sliced them up and glued them down to my white foundation card with the cracks showing. then i stamped this southwest-style "mimbreño chicken" image on top and heat-embossed it with white embossing powder. i like how the cracks almost look like there are wires of a cage or fence on top of the bird. click the pic to zoom in. we also got an origami lesson from liz - we each take turns teaching the group something new. we made cute folded hats, seagulls, pinwheels, and tulips. we're skipping our august meeting to accomodate vacations, then our theme for september will be...origami! tomorrow i'll share the other bird atcs i got from the group.